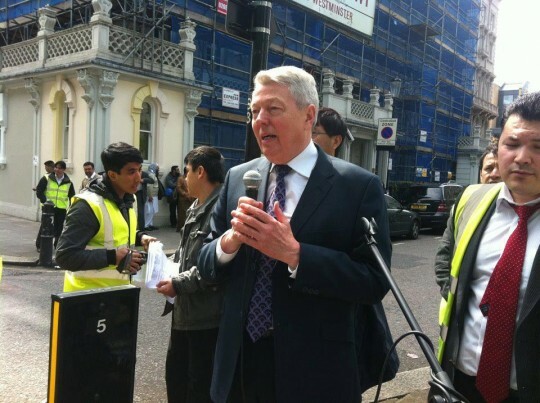 Former Home Secretary and MP Hull Alan Johnson addressing to Hazaras protesters in front of Pakistan Embassy London. LONDON: Government of Pakistan must make sure safety of Hazaras in Quetta and those involved in the killing of Hazaras must be brought to justice, says former Home Secretary and MP Hull Alan Johnson here while addressing to Hazaras protestors in front of Pakistan Embassy London. I’m here to express my solidarity with Hazaras who face ethnic cleansing in Balochistan and underlined the government of Pakistan to take the issue seriously and urged to take action against the perpetrators. While expressing his concern over the plight of Hazaras, Alan Johnson maintained that over 700 Hazaras had been killed and the government didn’t seem ready to protect Hazaras by bringing criminals to justice. “Since the parliamentary debate on March 1st, 2012, scores of Hazaras have been killed and targeted that’s why it is very increasing concern for our parliament and I think your demonstration today will raise the profile of this issue and will draw the attention of other parliamentarians to what’s going on so the concentrated actions through the UN, Foreign office, European Union can ensure that we stop what is a horrendous killings and the Hazaras can live in peace in a country that they have done too much to contribute over the years”, he explained. He condemned the recent wave of the killings of Hazaras in Quetta, Pakistan and criticised Pakistani government for being ineffective in taking effective measures against the perpetrators who persecute Hazaras on daily basis and with impunity. It’s responsibility of the government to protect minorities and all possible measures need to be taken to ensure minorities rights in Pakistan, he said and further added that British government was in close connection with government of Pakistan in addressing minorities rights. Addressing to the protesters, Ali Hikimi vowed to keep protesting with full extend if the killings of Hazras didn’t stop and asserted that Hazaras wouldn’t be left alone in difficult times. He called upon the Hazaras to remain united to fight terrorism by peaceful means and maintained that present government had totally failed in view of providing protection to Hazras in Quetta Pakistan. Jafar Attai a Hazara Intellectual addressing to the protestors said that it was matter of great sorrow that the government of Pakistan was unable to stop the killings of Hazaras in Quetta going for more than a decade. At the end of the protest, a memorandum was also presented to Wajid Shamsul Hasan, Pakistan’s High Commission to the UK. Sama Naaz, Luci Woodland Chairperson of Friends of Hazaras, Habib Ahmedi also spoke to the protestors. The protestors were chanting slogans like Down with terrorism, Stop target killings of Hazaras, Down with sectarian violence and Balochistan Government must be dissolved. Hundreds of Hazaras from all over UK attended the protest.